Roasted Potatoes With Garlic Sauce – the best roasted potatoes you will ever eat. 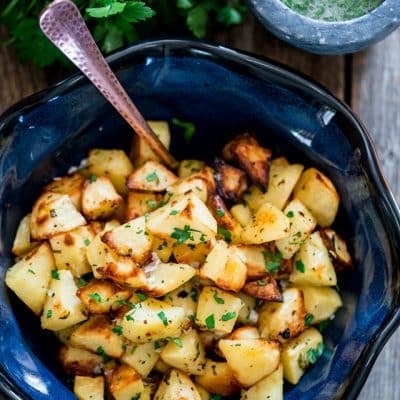 These potatoes are tossed generously in fresh garlic and parsley, then roasted to golden brown perfection. Ever since I was a little girl, this version of roasted potatoes with garlic sauce has been my favorite, we basically used to have these potatoes every Sunday for dinner. My mom would always pair this with a roasted chicken and what an awesome dinner that was. 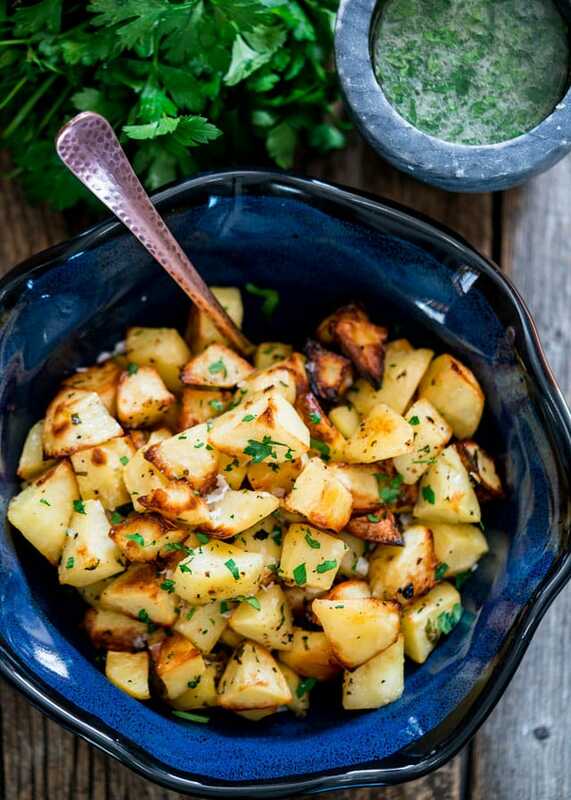 Just the thought of these potatoes and this delicious garlic sauce makes my mouth water. Whenever people ask me about traditional Romanian cuisine, this garlic sauce is the first thing that pops in my mind because we really put it on everything. It’s perfect with any meat, and it’s just unbelievable on roasted potatoes. You can always smell this sauce on people as well, because of the garlic, but if you’re all enjoying this dinner together it no longer matters, you’ll all smell the same. Not to mention garlic is good for you. But trust me when I say this garlic sauce makes all the difference. These roasted potatoes with the garlic sauce is a treat, you’ll love them! To make the garlic sauce you’ll need a mortar and pestle. Put the garlic and salt in a mortar and pestle and crush the garlic until it becomes a paste. Add the oil, parsley and water to the garlic and mix well. This is a good workout on your arms, trust me. The way I roast my potatoes, makes them crispy on the outside and soft on the inside, they are just perfect. Not to mention they are so easy to make and pretty cheap too. Usually I use a baking sheet and there’s no need to butter it or anything because we’ll add olive oil on the potatoes. Start by preheating your oven to 400 F degrees. Peel and clean the potatoes then cut them into wedges or cubes. Transfer the potatoes to the baking dish, season with salt and pepper, pour the olive oil over them and about half of the garlic sauce and toss well. Cover with aluminum foil and bake for 30 minutes. After 30 minutes, remove the aluminum foil and bake uncovered for another 30 minutes or until the potatoes are nice and crispy and golden brown. After you remove them from the oven, transfer them to a big plate and pour the garlic sauce over them, or you can simply use the sauce as a dip. Put the garlic and salt in a mortar and pestle and crush the garlic until it becomes a paste. Add the oil, parsley and water to the garlic and mix well. Set aside. 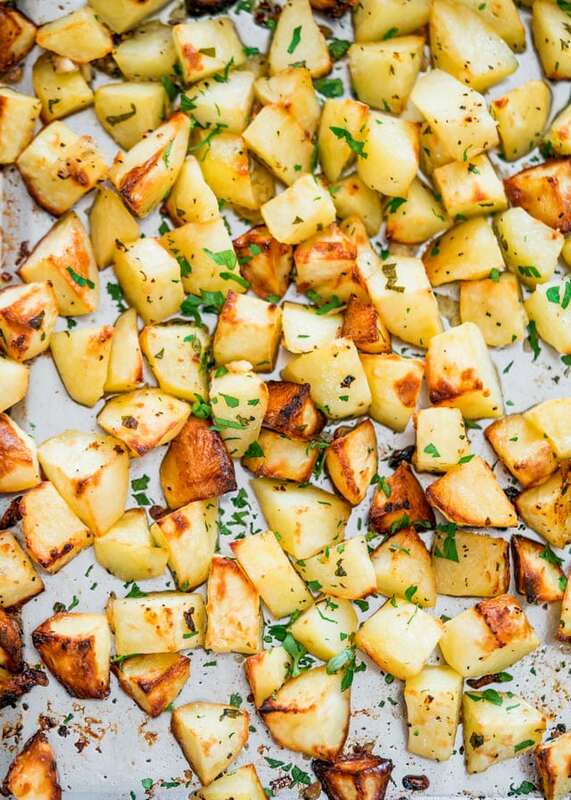 Cut up the potatoes into wedges or cubes. 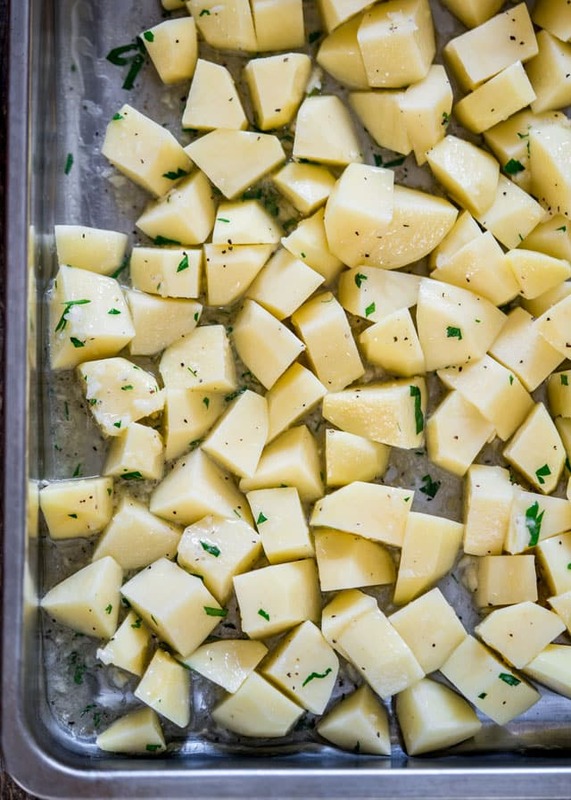 Transfer the potatoes to a baking sheet, season with salt and pepper, drizzle with olive oil and add half of the garlic sauce over them. Toss them well then cover with aluminum foil and bake for 30 minutes covered. After 30 minutes remove the aluminum foil and bake for another 30 minutes until they turn crispy and golden brown. Before serving, pour garlic sauce over the hot potatoes or use the sauce as a dip. I recommend using fresh garlic in this recipe versus the pre-minced jars of garlic. Recipe originally shared April, 2012. For a lower fat recipe, instead of roasting our potatoes with 4 tbsp of olive oil, Can we just use an olive oil spray over the oven pan? I made this dish for our annual garlic tasting party. Four different types of garlic used in exactly the same amounts and tasted tested. With several people involved, we test these four garlic varieties (unknown to the preparers) in different forms; raw, sauteed, baked, etc… and then rate them. It’s amazing how different they all are! This dish really accentuated the garlic and everyone loved it. One garlic, in particular, was so hot some people couldn’t finish it. The other three were so rich, people were licking their plates. Excellent sauce that will be a staple in my diet. Thank you so much! We only had mujdei last Saturday, but now I am craving it again! Can uyou use minced garlic? Do you mean the one that comes in a jar and is already minced? No, I wouldn’t use that garlic, I’d go with fresh garlic cloves for this. Love this recipe. I like that I can put this in the oven and not worry about it while I make the rest of the dinner. Your recipe sounds amazing and I can’t wait to try it. Since the garlic is not cooked, is it pretty hot? Not really Emily, but it could depend on the garlic too, I’ve had some garlic that did turn out to be a bit hot. But you can use as much or as little as you want. Thanks for sharing!! Looks great! Made these tonight. Ate them with broiled cod. Absolutely great. Oh I’m glad you like them. The garlic sauce goes great with the cod too, hope you tried it. Oh! These fries look amazing! I need to try them this weekend! I, too, found your recipe through Foodgawker! So excited about all the recipes on your site! I just discovered your site from foodgawker and made these just now…..addicting!!!!!! thank you!!! I just discovered your site through food gawker and have been looking around and am very excited! This will be the first recipe I make from here. I often make roasted potatoes, but I need to try that galic sauce! Then, I am going to make the Romanian meatball soup. thank you for sharing!! 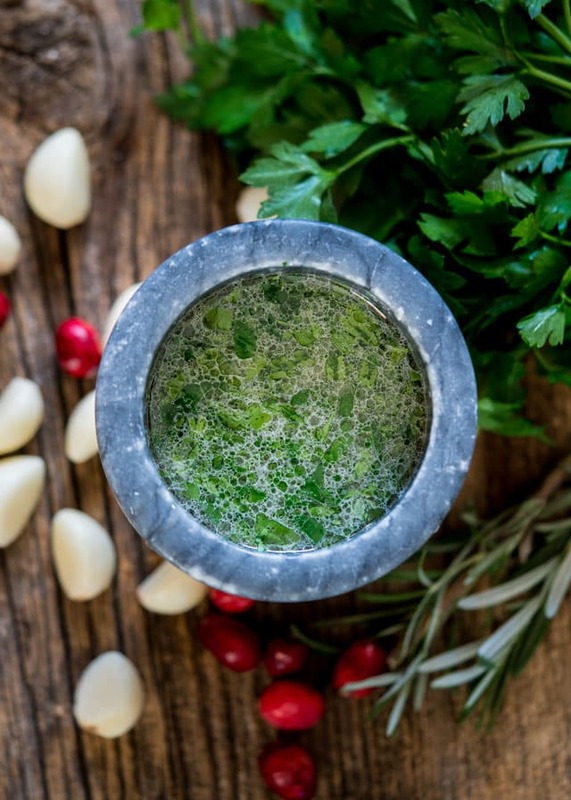 Do you have any ideas for how one could make this if you didn’t have a mortar and pestle? I have a food processor but don’t know if I’d be able to get it pasty enough. Your thoughts? Do you really use a head of garlic or one clove? Oh my dear one clove would not be enough, you need a whole head of garlic. You don’t have to use the entire sauce over the potatoes though. Usually I reserve some to dip the wedges in as well. The garlic sauce will be great for chips, pita bread, and whatever I have in the fridge…Thanks for sharing! Definitely trying that garlic sauce, this whole recipe sounds great!